Our Speaker Series for 2019 will feature a notable guest speaker every other Sunday through out July and August. 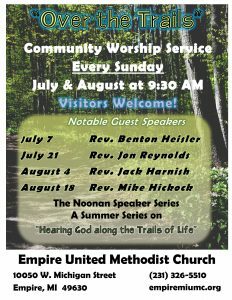 There will be just one Sunday morning worship service meeting at 9:30 AM during these months. Our worship time will be one hour earlier than usual. 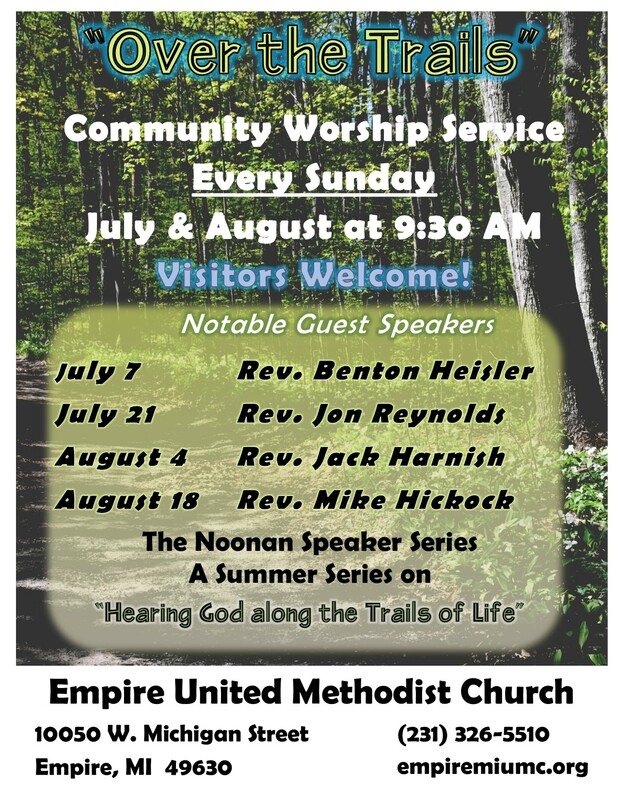 Vacationers, Friends, Family and neighbors are welcome to come and join us for these special services! Rev. Benton R. Heisler serves as the Director of Connectional Ministries (DCM) for the Michigan Conference of the United Methodist Church. Prior to this responsibility, Benton was the DCM for the West MI Conference of the UMC for nine years. He has also served as the District Superintendent of the Lansing District, in a variety of congregations across the state of Michigan and as a teacher & basketball coach. In 2008 Benton was awarded The John and Ruth Mount Outstanding Alumni Award for Parish Ministry, by the Methodist Theological School in Ohio. Benton is passionately committed to Christ, his wife, Linda, and their family. He has two married daughters, a three-year-old grandson and two Golden Retrievers that came to them from rescue situations. Benton lives into a vision, expectation, and goal that every local congregation can be equally passionately committed to a relationship with Jesus Christ, and desire to build, repair, and restore people and places of community, for the sake of the Kingdom of God and the transformation of the world. Rev. Jon Reynolds currently serves as an Associate Pastor at Cass United Methodist Church in Detroit with the responsibility of starting a new community of faith in the city. Before his time in Detroit, Jon served as an Associate Pastor at St. Paul’s United Methodist Church in Rochester, Michigan where he started two new worship services and helped the church grow over the last six years. Rev. Jon is married to Rev. Lindsey Hall who serves as an Associate Pastor at Birmingham First United Methodist Church. Together, they have two children, Joshua and Lydia and a Labrador named Sam. Jon’s passion in ministry is reaching new people with God’s incredible love. Rev. Dr. John E. Harnish is a retired United Methodist pastor on Platte Lake in Benzie County. He served churches in the Detroit Conference, retiring from First United Methodist Church in Birmingham in 2013. Previously, he served First United Methodist Church in Ann Arbor, Court Street UMC in Flint and Dexter United Methodist Church. For seven years he was the associate General Secretary of the General Board of Higher Education and Ministry in Nashville, TN. He is currently a Trustee at Adrian College and most recently served as the Interim Pastor at Church of the Dunes in Grand Haven. He is married to Judy Stone Harnish, daughter of Marge and Burdette Stone who were active members of the Empire UMC. He is a regular columnist for the Record Patriot Newspaper and writes a weekly “Monday Memo” at www. jackharnish.wordpress.net.